Disney's Frozen captured the hearts and imaginations of audiences everywhere, and it's the perfect inspiration for costumes. Whether you're planning a Halloween look, need something to wear to a costume party, or simply want to have some fun dressing up, you can make or buy a variety of looks to emulate your favorite characters. As the main characters of the movie, Anna and Elsa are both beautiful and brave. Anna must rescue her older sister while Elsa learns to control her magical powers. They complete these tasks in style, wearing everything from stunning coronation gowns to beautiful Scandinavian-inspired dresses and regal capes. Choose a royal blue gown as your starting point. If the gown is sleeveless, add a long sleeve blue shirt below it. Use gold, pink, green, and light blue fabric paints and a stencil, like Folkart Wildflowers and Butterflies, to create a pretty floral design on the skirt. Layer a fitted black vest over the top of the dress or use black fabric paint to create the classic black bodice of her dress. If you have time, you may want to add a few stenciled flowers to the black bodice as well. You can also make Elsa's gorgeous ice queen dress by modifying an existing light blue gown. You'll need to stop by the fabric store to pick up 2 or 3 yards of blue sequins, 2 yards of blue 1/2-inch-wide ribbon, and 1 or 2 yards of white organza, ideally printed with a snowflake pattern. The amount of fabric and sequins you need will depend on the size of the person wearing the gown. Use hot glue to decorate the bodice of the gown with the blue sequins. Measure from the shoulder of the gown to the hem. Measure the width of the skirt. Cut a rectangle of organza roughly to these dimensions, and hem all four sides. Fold over one short side by about half an inch and sew to make a tube. Thread the ribbon through the tube and gather the fabric on the ribbon. You now have a simple cape. Use white and silver fabric paint and a free snowflake stencil to decorate the skirt of the dress. Allow this to dry. When you're ready to get dressed, put on the gown and tie the cape around your shoulders. Simplicity 1210 - This adult-sized pattern will help you make the beautiful appliqued dresses and capes from the movie. You can choose to make the outfit for Anna or Elsa, and the pattern comes in two size options. HH covers sizes six through 12, and R5 covers sizes 14 through 22. The basic construction of the dresses and capes is fairly simple; however, the applique takes some very precise cutting. This pattern is available directly from Simplicity or at most craft stores and retails for about $12. McCall's M7000 - Although this pattern isn't officially a Disney version, you can use it to make Anna's everyday outfit and Elsa's ice queen dress. You'll need to have sewing experience, but you don't have to be an expert. The pattern has instructions for sizes three through 14 and retails for about $4 from McCall's or your local fabric store. If making the princess costumes isn't an option, you can buy costumes for both Anna and Elsa, along with helpful accessories. Girls Anna Costume - This classic option from Party City features Anna's Scandinavian-inspired dress, although the cape is sold separately. It's made from satin and comes in sizes small for girls size four through six and medium for sizes eight through 10. A toddler version is also available. The dress retails for about $30, and the cape is $10. Anna Deluxe Coronation Gown - For girls who want the fancier version of Anna's costumes, this coronation gown from the Disney Store is the ultimate choice. Crafted from organza and satin with golden trim, it comes in sizes four through 9/10. This spectacular outfit retails for about $90. Traveling Anna Deluxe Costume - This gorgeous Anna dress comes in adult sizes small through extra-large. It seems to run a bit small, which means the size small could perfectly fit older girls who may have a hard time finding Anna costumes in their sizes. The beautiful dress and included cape are made of satin and velvet and retail for about $60 from HalloweenCostumes.com. Anna Coronation Costume - For a stunning coronation look, try this version from Costume Express. It comes in sizes 4 to 14. The gown has a black bodice, gold, tea-length skirt, and off-the-shoulder teal cap sleeves. It retails for about $50. Elsa Costume for Girls - Party City offers the classic Elsa look in this ice blue sequined gown with sheer snowflake overlay. The iridescent blue fabric shimmers beautifully. This dress comes in girls sizes small, medium, and large to fit size four through 12, and there's also a toddler version. It retails for about $30. 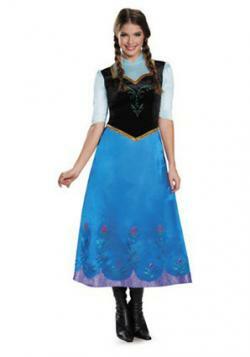 Elsa Light-Up Costume for Kids - For the ultimate Elsa costume, try this light-up dress from the Disney Store. Made of luxurious satin, tulle, and organza, this floaty gown has lots of twinkling lights that illuminate with every step she takes. It comes in sizes four through 10 and retails for just under $200. Elsa Dress for Women - This simple knee-length version of Elsa's blue gown is easy and comfortable, allowing you to enjoy parties and events without the constraints of a long dress. The stretchy fabric and sheer sleeves are practical and fun. It comes in sizes small through large and retails for about $40 from Spirit Halloween. Anna's Boots - These toddler and little kid-sized boots are the perfect footwear to pair with an Anna dress. They are made of synthetic materials and come in toddler 7/8 through little kid 2/3. They retail for about $22 at JCPenney. Tiara - Ideal for both Anna and Elsa, this sparkling tiara features both sisters in a cameo. It has clear and blue gems. Reviewers on Amazon note that the tiara works well for adult costumes too. It retails for about five dollars on Amazon. Elsa Wig - Elsa is famous for her long, platinum blond hair; however, most people will need a wig to get this effect. You can purchase a one-size-fits-all version from JCPenney for about $20. Use your favorite princess makeup techniques to make your look authentic. The adorable snowman sidekick in Frozen is the perfect choice for Halloween, a costume party, or any other fun event. 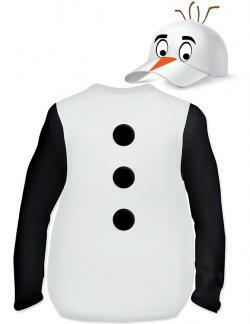 You can make your own Olaf-inspired costume or purchase a ready-made option in your size. You don't need a sewing pattern to make your own Olaf costume in any size; you can simply modify some basic clothing items. Start by cutting the sleeves off the white t-shirt. Snip right along the seam. Cut three rough circles out of black felt, each about 2 or 3 inches in diameter. Apply fabric glue all the way around the edges of the felt circles and stick them on the t-shirt as Olaf's coal buttons. Allow the glue to dry while you work on the hat. Cut a long carrot shape out of orange felt to make Olaf's nose. Glue it to the baseball cap. Most of the carrot should be on the bill of the hat, although the rounded end can be on the crown. Cut two black ovals out of the craft felt, each about 3 inches long by 2.5 inches wide. Cut two slightly smaller white ovals and two black circles as well. Use fabric glue to layer these pieces for Olaf's eyes, placing the black circles near the bottom of the white ovals and the white ovals on top of the black ovals. Glue the eyes on the crown of the hat on either side of the nose. Cut two eyebrow shapes from black felt and glue these above the eyes. Use the scissors to cut two small slits just behind the top of the baseball cap. Thread two brown pipe cleaners through the slits so that all four of their ends stick out the top. Give the pipe cleaners a twist to hold them in place. Check to make sure the fabric glue is dry on the shirt. Cut a tiny slit in the hem of the t-shirt. Attach a safety pin to the end of the elastic and thread it through the hem. Tie the two ends of the elastic together to secure them and work the knot into the hem so it's hidden. The hem should be gathered now. When you're ready to get dressed, put on the white pants and black t-shirt. Slip the white Olaf shirt over the top and allow the top to blouse out a little. Put the baseball cap on your head. With the cap on, bend the pipe cleaners to make sure they are standing up and that they are at slightly crazy angles. Put on the black gloves and go have fun! Olaf Plush Costume for Kids - This adorable outfit features a soft and fluffy Olaf bodysuit with hood, shoe covers, and gloves. The cozy fabrics are perfect for chilly Halloween nights, but it can also work for dress-up. It comes in toddler and kids sizes two through eight and retails for about $20 from the Kohl's. Olaf Headpiece and Buttons - With this costume from Oriental Trading Company, you add the included buttons to your own white shirt. Then you don the detailed Olaf headpiece, and you're good to go. This will fit older kids and adults and retails for about $30. The prince of the Frozen movies also makes great inspiration for costumes. Whether you make your own outfit or purchase one, you can be sure you'll turn heads. The focus of Hans' outfit is his military-style tailcoat. Make an adult version using this very tricky 1795-1820 Men's Tailcoat Pattern. It has instructions for men's sizes medium through extra-large. Use white heavyweight fabric for the body of the coat and black for the facings and cuffs. Add lots of decorative braid to complete the miliary look. The pattern retails for about $20. Pair the jacket with dark pants, a dark vest, and a royal purple scarf or ascot. Although there aren't any tailcoat patterns for boys, you can convert a second-hand ring bearer tailcoat into a Hans outfit. Purchase the jacket in the appropriate size and then add black facings, black cuffs, and military braid. If sewing the adult version isn't an option, you can also look for a tailcoat and modify it similarly for a man. Finding the right jacket may take some time, so it's a good idea to get started early. Prince Hans Halloween Costume - This adult version is custom-made, so it's sure to fit you. You can order adult sizes small through XXL and provide your measurements to FanRek. The company will craft the costume from linen, cotton, satin, and wool, and process your order within 14 business days. This outfit retails for about $105. Prince Hans Tailcoat Costume - This is another made-to-order costume, but Skycostume will make it in children's sizes as well as adult sizes. You can select from sizes XS through XXL or provide your measurements for a custom fit. The company can guarantee Halloween delivery on orders placed before October 15. This costume retails for about $130. 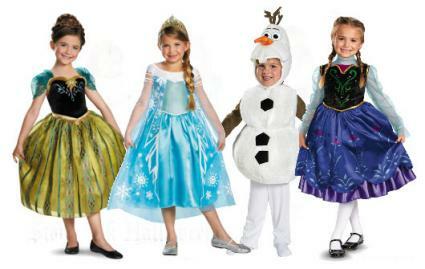 No matter which Frozen character you choose to emulate, you'll love your costume and get plenty of compliments on it. Whether you make it yourself or buy it, this is an outfit you can wear over and over for dress-up, costume parties, and Halloween.